Jack Thompson from the Grange Golf Club in South Australia secured his biggest win to date taking out the Riversdale Cup on Sunday. Thompson setup his maiden national ranking title with an impressive second round 64 to finish at 14-under for a five stroke victory over Royal Melbourne’s William Heffernan. Thompson fired rounds of 69-64-68-73 to leave the rest of the field in his wake. “It’s a bit out of nowhere this win, I can vouch for that,” said Thompson. Thompson’s victory came off a 3rd place finish at the Avondale Medal in January and a solid performance at the NSW Amateur in Canberra. Over the weekend Thompson was able to master the slick Riversdale greens and produced smart golf finding fairways and greens having already set the benchmark with Friday’s blistering 8-under-par round. With his hometown SA Classic being played at The Royal Adelaide Golf Club, Thompson heads to the event full of newfound confidence that his game is heading in the right direction and that he can seriously compete in Australia’s top-ranked amateur tournaments. “It’s an event I’m really looking forward to and its on a layout which suits my game,” says Thompson. 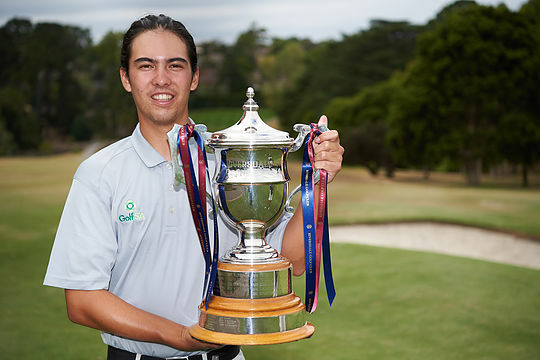 Former Australian Amateur champion, Matias Sanchez, finished in 3rd position at 8-under with Queensland’s Douglas Klein and New South Wales Nathan Barbieri rounding out the top-5 places. This was the 110th staging of the Riversdale Cup making it one of the oldest amateur tournaments in the world. Thompson’s name will now be etched alongside past champions Aaron Baddeley, Ryan Ruffels, Lester Peterson, Jake Higgingbottom, Brady Watt, Brendan Jones, Stephen Dartnall and Nathan Holman, to name a few, as well as fellow South Australian Jordan Sherratt, who was the last South Australian to win the title.